I discovered this magical condiment at a little restaurant in San Francisco's Chinatown called Joy Hing BBQ Noodle House. I'm pretty sure the owners are from Hong Kong, but the restaurant is best known for its Pho Ga, the magical elixir that is Vietnamese chicken noodle soup. Yes, the broth is delicious. Yes, the poached chicken is tender and perfectly seasoned. But what makes people go crazy for the soup at this particular restaurant is the Ginger Scallion sauce. I always ask for extra when I go there, but now I'm making it myself. I might have to make a double or triple batch next time. The sauce is Cantonese and usually served with poached chicken, but you can put it on tofu, rice, scrambled eggs, or just about anything else. It takes just a few minutes to make and a few more to steep. about 1 oz ginger (a 3 in by 1.5 in knob is about right). 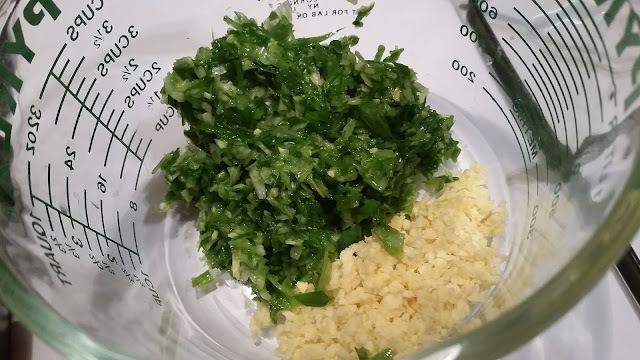 about 4 oz scallions, aka green onions, washed. The ones in this pic were pretty big, so I just needed 4. You'd usually need more like 5 or 6. Peel the ginger and cut into roughly 1/2 inch pieces. Forward this video of Martin Yan to about 0:45 to see how to do it with a spoon, and keep watching to see some mad knife skillz! Cut the scallions into 1 inch pieces, cutting off only any blackish bits. The rest can go in. Toss the ginger into the food processor and blitz it until it's finely minced but not yet pureed. This won't take long, so don't walk away! 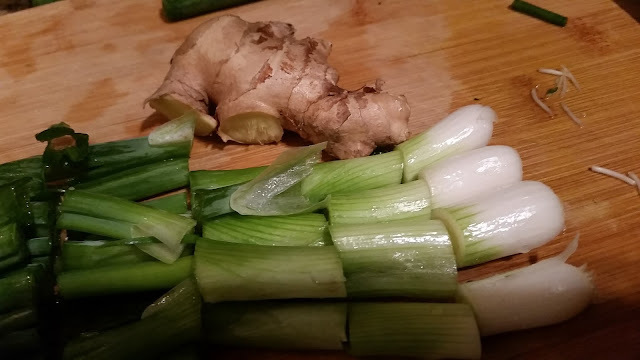 Remove the ginger and do the same with the scallions. You don't have to wash out the food processor bowl in between since it's all going in the same bowl. Yay! 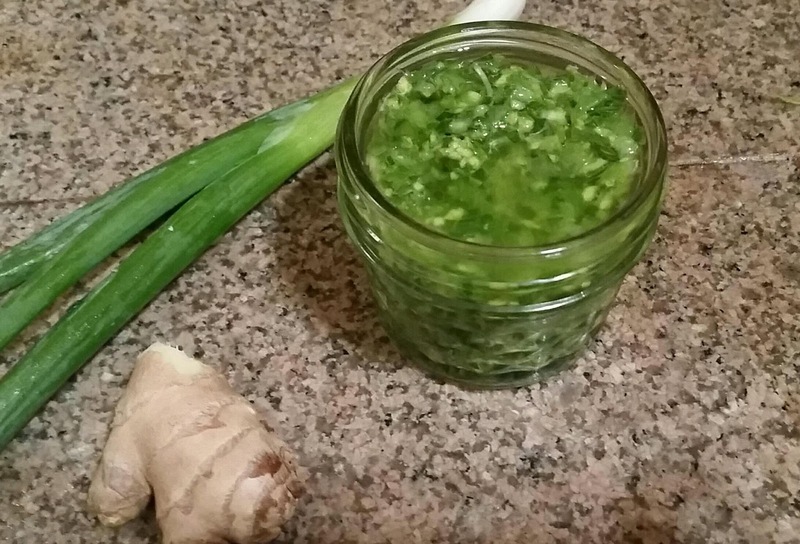 Put the ginger and scallions in a bowl that is heatproof and will hold at least four cups, maybe more. It's important to use a larger bowl than you think in case the oil bubbles up a lot when you pour it in. Please don't hurt yourself! Stir the salt in with the scallions and ginger. Put the oil in a small pot and heat it just until a small piece of scallion sizzles when you put it in the oil. Carefully pour the oil over the ginger scallion mix and stir well. Let sit for about 15 minutes to cool and blend the flavors together. Peel and mince the ginger very finely. Keep showing off your amazing knife skills by mincing the scallions very finely. Really delicious! Thank you for posting this. Heating the oil really does the trick. Will be using this on everything now. Yay! I love this stuff so much. Thanks for commenting. Will this sauce last in the fridge for a day? Absolutely. A couple of days.